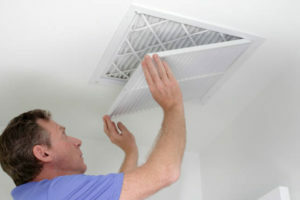 How Often Do I Need to Change My HVAC Filter? Did you know that how often you change your filter is affected by how many people and pets are in your home? Use this handy guide to make sure your filter is at its most effective. Your air filter, while seemingly small compared to the rest of the system, is an extremely important component to your HVAC (heating, ventilation, and air conditioning) – not only its efficacy but also its longevity. If you want your system to last longer, take care of your filters. This is the most simple, inexpensive maintenance that most homeowners can do themselves. In addition, keeping fresh filters in your system will help keep your energy bills down. The filter’s job is to remove particulates (meaning, dust, hair, dead skin, dander, soot, and smoke) from the air. Not only does this result in cleaner air quality for you and your loved ones but because the air going through the HVAC is cleaner, the machine will perform better and last longer. You will be happier with the results of your air quality and you will need to replace your HVAC less frequently. In Florida, this system is a crucial asset to your home and in the middle of summer, you’ll be glad you took care of it! What happens to a filter that isn’t changed? If you go too long without changing your filter, it will become clogged with all of the particles it is pulling out of the air. The flow of nice conditioned air (hot or cold, depending on what time of year it is) will not be as strong and productive. As airflow is reduced inside the system, the fans have to work harder to pull air through the system and will wear out more quickly. Because the air isn’t circulating properly, your system will need to run for much longer to bring your house to the desired temperature. This will result in your energy bill being much more expensive than it needs to be! Note that it also depends on the frequency of use of the house. A vacation home that is only used a couple of times per year could have its filter changed once or twice per year and still be in good condition. One person in the house – live by yourself, or kids go away to college? You can change your filter less frequently due to less traffic in your home. It may seem odd that adding just one little dog or cat can cause you to change your filter more often. But in addition to dander, fur and dirt, pets tend to bring in more pollen and dust from outside in their coats. Change it more frequently – as frequently as every 20 days for houses with multiple long-haired dogs. You may wish to change your filter more frequently. If you’re not sure if it’s quite time to change your filter, you can check it. If you pull out your filter and hold it up to the light and you cant see light through it, dust and other particulates are blocking the filter and it is ready to be changed. Do the seasons affect my air filter? The frequency at which you change your air filter should be adjusted based on the seasons and how much use your system is getting. Here in Florida, in the summer, we put a lot of use and pressure on our air conditioning systems! It’s important to make sure that during those busy months of April through September filters are changed more frequently. Some systems during the hottest months are running most of the day and night, so they need their filter to be at its best! How do you know what air filter to buy? Before you go shopping for a filter, you need to check the filter size. You want to make sure the replacement air filter you buy is the correct size for your system. If it is too large it won’t fit at all and won’t work. If it is too small there will be gaps where unfiltered air with particulates can get through into the system. Turn off your air conditioning system first. When you remove the filter, especially if it hasn’t been changed in a while, some dirt may come loose and either be blown out into the house or sucked into the system it isn’t turned off! Look on your current filter for a sticker with dimensions printed on it. An example would be 12x24x1. You can write these dimensions down or just snap a photo of the label with your phone. Sometimes there is no sticker or it is faded. In that case, you will need to measure the filter yourself. Just measure the length of the filter, write that down, and then the width, and the height, and write those down. There you have your dimensions. Now that you know what you need, you can head to the store to purchase the correct filter. Hardware stores will have the widest selection, but some grocery stores have a small selection of air filters. Some filters come in multi-packs, so you can have them on hand. This is especially convenient for families with a lot of pets who need to change their filters more frequently. There is also a relatively new way to make sure you have filters to change frequently. Subscription services will now deliver filters on a one, two, or three-month schedule depending on your needs! Some people prefer this because the physical delivery of the filter reminds them it’s time to change it. However you get them, just please, make sure you change them! A filter may not be the most glamorous purchase but would you forget to buy a new toothbrush for months on end? Well a filter keeps particulates from your air just like a toothbrush keeps plaque from your body. So just refer to our handy guide above to keep your air fresh as a daisy.